I’m an owner handler exhibitor – well, I used to be an owner handler before I matured into an older lady who runs with a gimp and who can’t keep up with her dogs – I let a handler do the work these days. But, while I was an owner handler I love, love, loved being in the ring and it goes without saying that my overwhelming feeling of love amplified to rock music decibel when I also won. 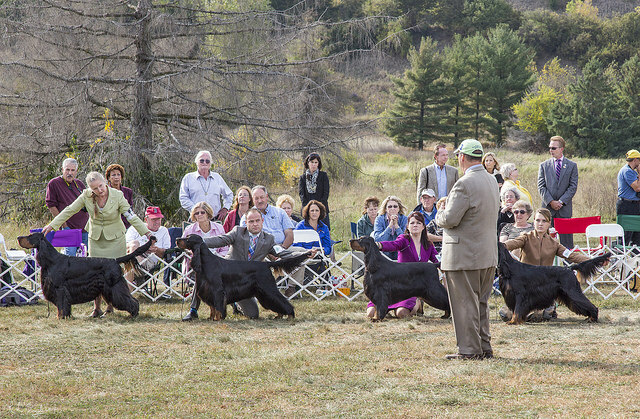 I finished dogs from the Bred by Exhibitor class and have earned my fair share of wins at Gordon Setter Specialties. Group judging was beyond what I considered my forte, that’s where I’d really expect a dog to shine and that’s when I would step back to let a pro take the lead. Today, with my physical restrictions I sit ring side to man the cheering station…oh, and the water bucket…and the brush…and, well, that list is quite long you know. With all that said, I am sometimes taken aback when comments are made by exhibitors regarding how political a judge may be, how the win was stacked before the show started, how only professional handlers ever win under this and that judge, I’m sure you’re getting my drift. Sometimes when I’m watching Gordon Setter judging I am overwhelmed by the desire to help some hapless exhibitor get control over their dog, or grab a dog to show the owner a better way to groom, or maybe it’s to wake some exhibitor so they get to the ring on time. I’m no professional folks, I’m just like most of you, but one thing I do know and would like to share with you is that it is my belief that the professional often wins because he/she is a professional doing a professional job. Most times there is an obvious difference in the ring appearance of the professionally handled entry versus the owner handler’s Gordon Setter, and what I would like to say to all who bemoan their losses is that we must learn to look and act like a professional, to make our dogs appear to be handled professionally, to present only well groomed, conditioned and trained dogs if we intend to compete on that same playing field. Owner handlers can and do win without a doubt, but we too need earn the win by showing the judge the very best our dog has to offer. So, I started out to write this long blog about the basics an owner handler needs to learn and master in order to be competitive in the dog show ring when what to my wandering eye did appear but an article, well written and presenting the same advice I would share with you, my fellow exhibitors. Whether you’re just starting as a novice handling your own dog or if you’re simply feeling like you just can’t win, before complaining or blaming the pro for your loss, perhaps you might read this and judge yourself and the picture you and your Gordon Setter presented when you lost. Did you do your best but were beaten by a better dog, or could you have done something more to stack the odds in your own favor? I love owner handlers and I would do everything I know to help you win…but if you want really good advice, ask the pros and when all else fails take the time to watch them work, really watch them in action, there is so much to learn there! This article is a great place to start to learn how to be on your way to being a winning owner handler. Don’t forget – Be a Good Sport! 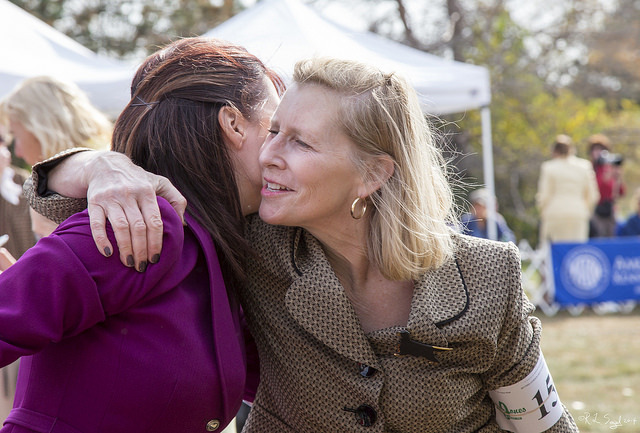 OWNER-HANDLERS: ADVICE FROM PROS AND PEERS. Diana Aulgur: I really enjoyed the article! Thanks for posting! Priscilla Suddard: The author read my mind ! I’ve been saying this for ages. You gotta step up if your gonna get put up ! Heather Bryan: Amen! I’ve been saying this for a while! Deanne Reiser: Great articles. I love the way you put it! Spot on. Also it frustrates me to no end when I hear people complaining about “politics” at shows, yet know nothing about their standard or the faults their dogs have. Let alone the proper way to present them. I know my dogs faults and more often than not agree with the judges choice. If a judge does not like my dog it’s ok. There will be another show. I also can’t tell you how many times I have walked out of the ring knowing exactly what “I did” wrong. Moved a dog when I shouldn’t have or not moved a dog when I should have. Or not having my dog under proper control when moving around the ring. But all in all, I love showing my dogs and strive to get better and better. As one of the article states, I spend a lot of time watching handlers I respect and always, always try and learn. It is a shame that the negativity at the shows from so many exhibitors is taking the fun out of the sport. Heathyr Ussery Aguilar: Thanks… great article and so so true. Being a novice to the dog world 6 years ago, I learned all that I could PRIOR to obtaining my first show dog. What a difference this has made during my first year showing! All of the advice, training and information (thanks to my friend and professional handler) collected over those 6 years has been truly instrumental and helpful to me. Not only did I practice and learn how to show a dog, how rings are ran, what patterns may be expected by a judge but also and most importantly, it helped me with the nerves of being a newbie while handling my heart and soul at the end of my leash. I couldn’t imagine walking into a ring, knowing nothing or next to nothing. Heather Bryan Amen! I’ve been saying this for a while! I do get sick of people whining about this! Karen Arterberry Good advice. I am enjoying Gordon Setter Expert. Thanks, Sally. Sundance Setters I hear your frustration Linda JavaHill Fitzmaurice. Nothing’s changed though, it’s not only about how the dog is presented. If you went into a store, having 2 minutes or less to buy a new dress and you were presented with one beautifully pressed and displayed on a mannequin and another wrinkled and dirty laying on a counter top which one do you think you’d choose if both were of equal quality and price? Kristyn McCartney Couldn’t have said it better myself!